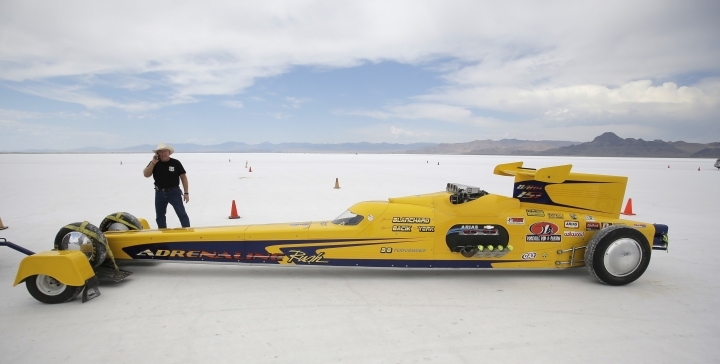 BONNEVILLE SALT FLATS, Utah — Blinding white salt stretches across the earth to distant purple mountain ranges, an otherworldly landscape famous for providing a natural track for racers seeking breakneck speeds but fragile enough that rain can easily break it down. 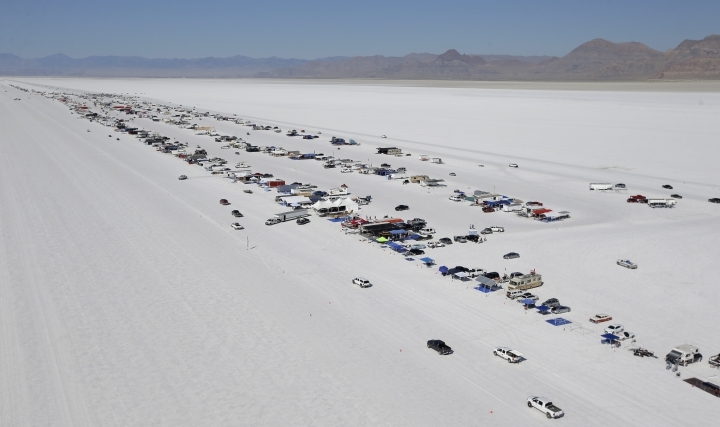 Thousands of adrenaline junkies have descended this week on Utah's Bonneville Salt Flats, coming from as far away as New Zealand, Japan and Russia. 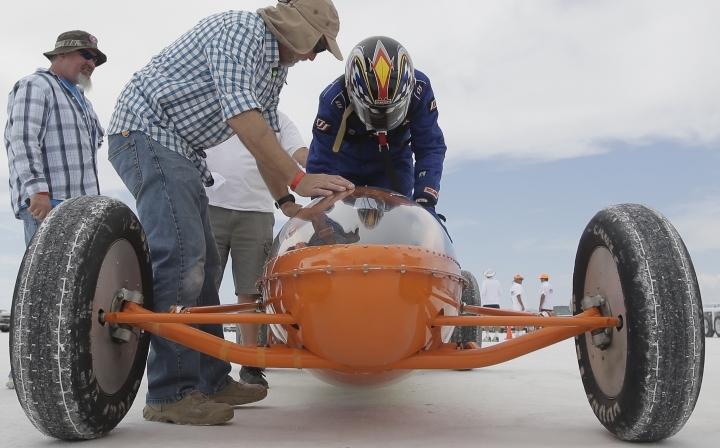 In this stark place about 100 miles west of Salt Lake City, they have set up a caravan of campers, tents and trailers as they spend a week trying to beat the clock — some topping speeds of 400 mph. 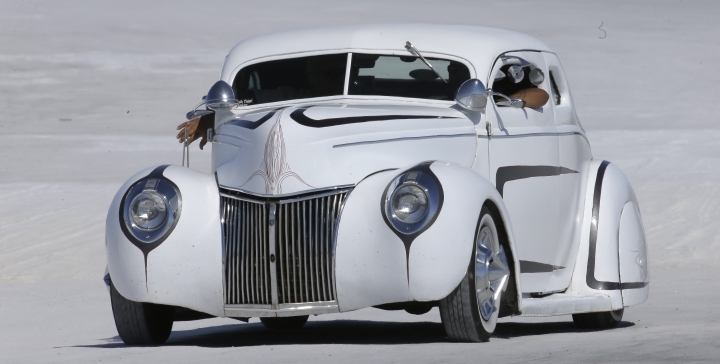 They haul modified motorcycles, vintage hot rods and roadsters, and custom vehicles that look like rockets or spaceships, with names such as "Disturbing Da Peace" or "Loosenuts Special." They'll wait for hours in line under the brutal sun just to get a chance to zoom across the flats, hoping to see if their latest modifications help them beat their previous records or go fast enough to earn a spot in the "200 mph Club." While the racers are glad to be back at Speed Week, which runs through Friday, it's a bittersweet return after a two-year hiatus marked by disappointments and accusations that federal land managers have failed to protect the unique area. U.S. officials partly blame heavy rains and say they're trying to preserve the salt by requiring a nearby mining company to pump brine onto the flats each year. 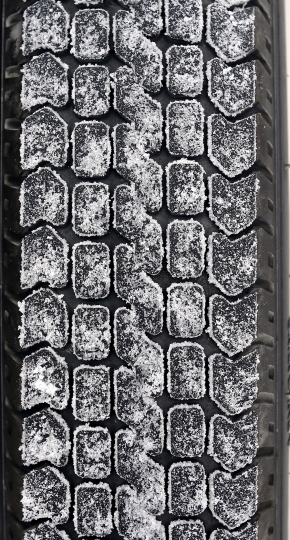 Wet weather and rough salt scuttled the major races in 2014 and 2015, and organizers say they no longer find enough smooth salt to set up raceways of 10 miles or more to give many vehicles enough room to hit top speeds and safely slow down. 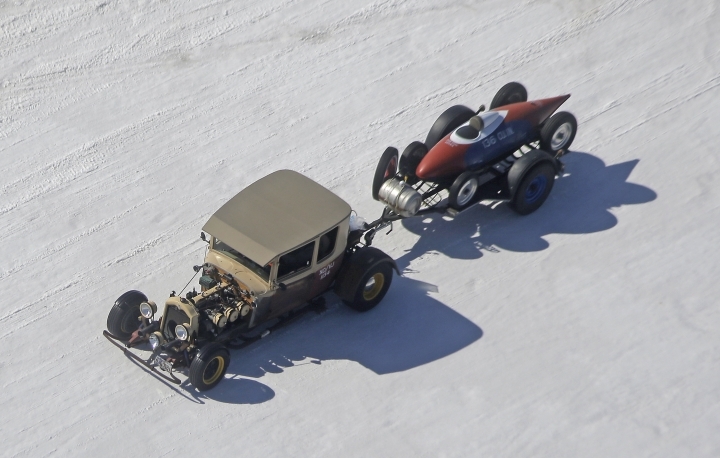 This year, organizers with the Southern California Timing Association found enough dry, relatively smooth salt to eke out three racetracks for Speed Week, the largest of several annual races at the flats. Racers say that while they're grateful weather has been favorable and they're whipping across the salt again, they pointed out the less-than-pristine conditions. "It looks thinner to me," said Ben York, a driver from Roseville, California, who has been coming to the flats since 2009. His team was trying to break a 334 mph record with their vehicle the "Adrenaline Rush," an elongated racecar style known as a Lakester. York said that when the salt is flat, it's very good, but this year it feels bumpy and coarse. 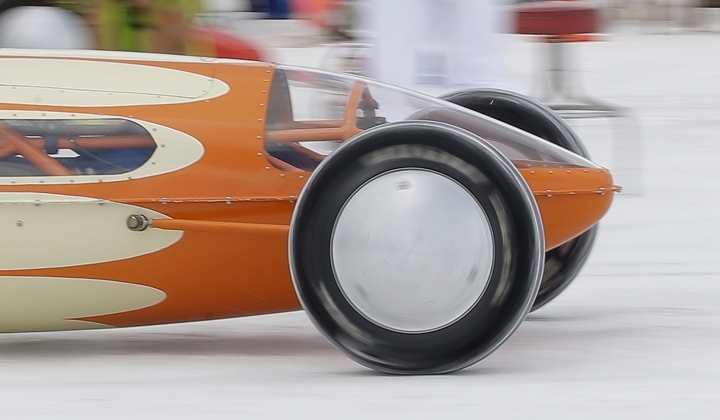 "Compared to past years, it's spotty at best," said Dallas Volk of Bountiful, Utah, whose family has been racing at Bonneville for nearly six decades. 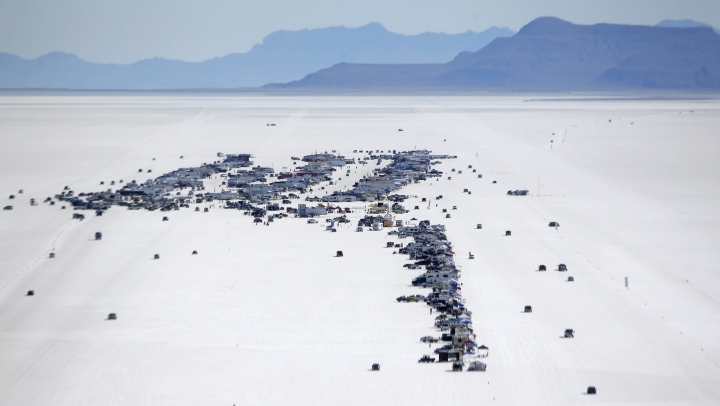 Volk, 49, who first came to the races as a toddler, was selling T-shirts and other gear out of a trailer to support the Save the Salt organization, one of several racing groups calling for federal land managers to keep the salt from depleting and lobbying members of Congress to step in. "You can definitely tell it's not the same salt it was five or six years ago," Volk said. 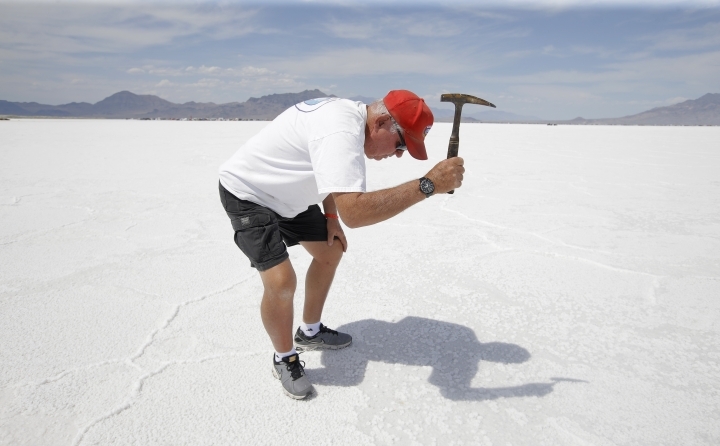 His father, Larry Volk, pulled out a pickax and struck it into the salt, revealing a layer of mud about an inch below, creating a speedway that's less hard and fast than it used to be. He said that when he started racing in 1958, they could find 14 miles of speedway where the salt top was 7 or 8 inches thick. "That's what we'd like to see it get back to," he said. 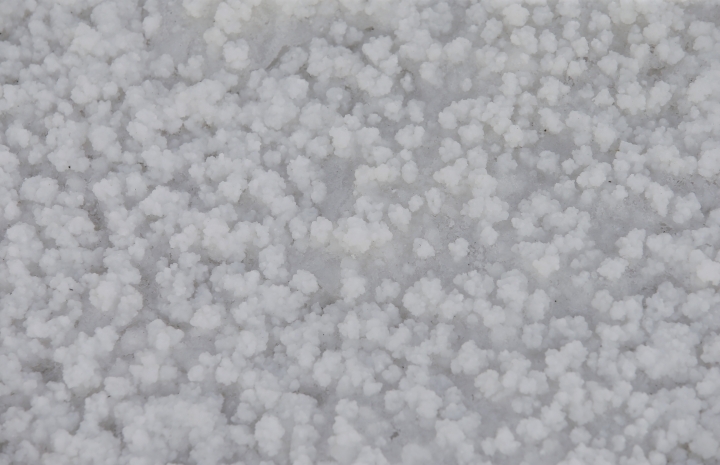 Monsoon storms are partly to blame for the cancellations, but it's unclear exactly why there appears to be a smaller, thinner expanse of smooth salt. The racing community says nearby potash mining is draining a salty aquifer that helps replenish the flats each year. The U.S. Bureau of Land Management, which oversees the flats, said it requires the mining company to pump several hundred thousand tons of brine onto the flats every winter so that when the area begins to bake under the summer sun, the water evaporates and the salt crust thickens. Racers want to see much more brine pumped on the flats every year and are working with Republican U.S. Rep. Chris Stewart on legislation to restore the area. His office said it's still drafting the legislation and would not offer details. Larry Volk said congressional action is a last-ditch effort to try to preserve the area for decades of future racing. 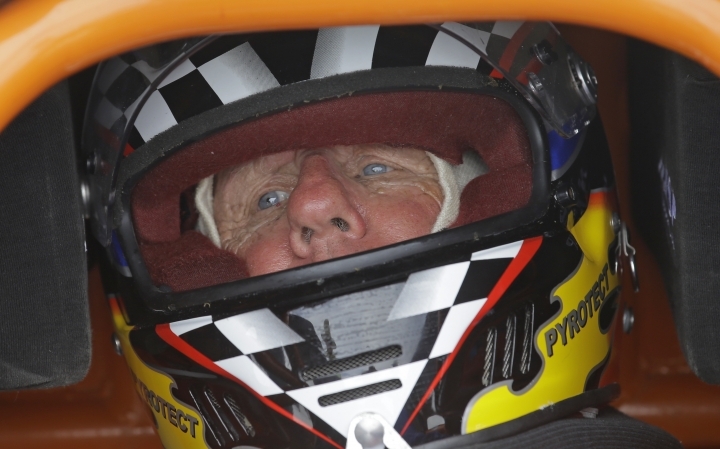 Though conditions are poor this year, Volk said the speed demons are still glad to be back. "We're racers, OK?" he said. "Give us anything and we'll try to race on it."